I have the young lady's name to be Carolato, Isoleta and Lola...spelling may not be exact. Which is true....so many different stories it is hard to know what to believe...I also read she was beaten before being shot...Those bruises could have come from the hard trip across the mountain especially if she fell alot. The on thing I can say is that this was a great tragedy for all concerned. Right on, Zoe... over the years I have read your grandfather's interview, as well as studied the report Indian Agent Claire True submitted to Washington DC of the incident, and Riverside Sheriff Fred Wilson's report. I also interviewed Maynard Swarthout, the son of Al Swarthout, who knew of of the hunt for Willie-boy and the cause of it. I get tired of folks trying to change the facts and make a fairy tale out of it, and to romance it. Facts are more exciting then legends. A lot of the information i use for my stories is from my extremely large family and their recollections of events and other sources i locate....The story of WILLIE BOY or Billy boy comes from my talks with my dad and most recently my uncle Le Roy who says his dad was in the chase as an indain scout....Families memories fade with time, and my uncle is 82. Do you know the GPS coordinates for the plaque ??? Is it somewhere that one might be able to hike to ?? To reach the gravesite take I-10 to SR-62 to Yucca Valley, left on Old Woman Springs Road through Flamingo Heights. Just past the sign marking the town of Landers turn left on New Dixie Mine Road (State Route 247). This dirt road takes you approximately 6.5 miles to a fence which marks the wilderness area prohibiting motorized traffic. It is a 2.5 mile relatively level walk to the gravesite. You can also follow the basin of White Water Creek from the 10 freeway back into the Hills on a 15 mile very hot, dusty trail but there are no signs or markers telling you where you are. It is the same route the Posse took back to Banning. Remember that the plaque is not a gravesite - it is merely the speculative site of where WB was during the shoot-out, although I have my doubts even about that. The story has always been that WB was on top of Ruby Mountain shooting down at his pursuers, but the site of the marker is two mountains, and 5 crow-flying miles, away from Ruby Mountain. There really is no properly informed disagreement that WB did not kill himself [Indians are not into suicide], but instead escaped to 29 Palms, got provisions, and went on to Nevada, where he died many years later. The "body" seen in the various pix is far too stout to be that of the athletic runner that WB was. If it had been him, they would have shown the face, as with all "brave" trophy hunters' pictures! The heft of the body is not explained by it having been in the desert for weeks, because coyotes would have devoured it, and the belt would not have expanded with a bloating belly. The pursuing cops did not want to concede that they could not catch one young brave, so they manufactured the story of his killing himself - there is nothing new about police, or long ago just as now, manufacturing "facts." If you head North from Yucca Valley on Highway 247 you will cross The Pipes Canyon Road...it was somewhere in this canyon that Carlota was killed. If you have a "Southern California Atlas & Gazetteer" you can see just north of The Pipes and off to the West of 247 the words, "Ruby Mountain." The plaque is out there....I have seen it, but I can;t remember the dirt roads we took to find it. 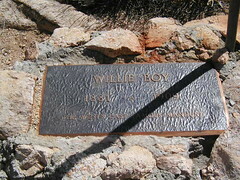 (I was a guest of Jim Sandos who wrote the book, "The Hunt for Willie Boy," and he knew where it was. Because the plaque's site constitues a "Native" burial site, they have blocked the road a few miles before the plaque site; so you have to get out and walk in. There must be locals who can point you to the site.